Before embarking on this trip to England, I told myself that this time I was really going to discover more than just coffee shops and antique stores. This time over I was going to scratch the surface and find out more about some of this beautiful country’s culinary treasures, and on the top of my list was Stilton cheese. Cheese known as Stilton was first sold by Cooper Thornhill, the inn keeper of The Bell Inn in the village of Stilton in the mid 18th century. Thornhill's cheese was cream based with additional cream added in stark contrast to most of the cheese of the day which was commonly made from partially skimmed milk and considerably cheaper. As the popularity of his cheese began to grow, Thornhill soon found it difficult to keep up with demand and enlisted a renowned Leicestershire (pronounced "lester-shire") cheesemaker named Frances Pawlett for help in its production. Pawlett then formed a cooperative with other dairies around her Leicestershire farm to produce this cheese using the Stilton recipe. With its location on the main road from London to Edinburgh, The Bell Inn soon became a main outlet to trade the cheese, with production being moved almost exclusively to Leicestershire and Nottinghamshire. Although there are many gaps in the history of Stilton cheese, what is known is that many people most certainly played a part in the evolution of this cheese, making it the delicious final product that we now enjoy. Today, true Stilton can only be produced in the three adjoining counties of Nottinghamshire, Derbyshire and Leicestershire by five licensed creameries. These facilities include Long Clawson Dairy, Colston Bassett Dairy, Cropwell Bishop, Tuxford and Tebbutt Creamery, and Websters. Production of this cheese by these dairies is strictly governed under the Protected Designation of Origin (PDO) by the European Commission. In advance of my trip to England I contacted Long Clawson Dairy. Having eaten their cheese for many years and knowing their reputation for excellence, I asked if I might be able to arrange a tour of their facility and learn a bit more about them and their products. Martin Harris, the dairy’s Export Manager, returned my e-mail and after much work on his part, obtained permission to give me and fellow blogger Jane, author of the blog Midwest to Midlands, a tour around their facility. On the morning of our tour Jane and I were met at the front office by Martin who gave us a short briefing before our tour began. We were asked to remove all of our jewelry or anything that might fall off of our persons during the tour and place it in an envelope that would be kept at reception. Martin stressed that if anything fell in any of the cheese in any stage we, along with the entire batch of cheese, would have to be destroyed. It was at this point I realized that he meant business and this tour would probably mean a hairnet, lab coat, rubber boots, and lots of hand washing. I wasn’t disappointed on any count. Before we got started Martin gave us a little history and told us that Long Clawson Dairy had recently celebrated its 100th anniversary. Originally started in 1911 as a cooperative of only 12 dairies, it has now grown to over 40. Each dairy in its cooperative has to be accessed yearly and a sample is taken and tested each time their milk is collected. If at any time hormones or anything else is detected that might cause the milk to be tainted, it is immediately incinerated. What’s not to love about that? Once the fresh milk is collected from the participating dairies, it is held in Long Clawson's tanks until it is pasteurized and pumped into the vats to be made into cheese. All dressed up, disinfected and ready to go; we were first taken into a large room that is home to several large vats which hold 4,000 gallons of milk each. Each one of these vats will eventually produce enough curds to make 250 pounds of Stilton. Thanks to Jane for this photo of the curds (bottom) and the whey (top of photo). The whey will be drained, concentrated and dried before and made into nutritional supplements. The first step in the production of Long Clawson’s cheese is gathering the milk from their participating dairies. After it is tested, cleared for production and pasteurized, the fresh milk is poured into the vats and starter culture, vegetable rennet and penicillium roqueforti (blue mold spores) are added. 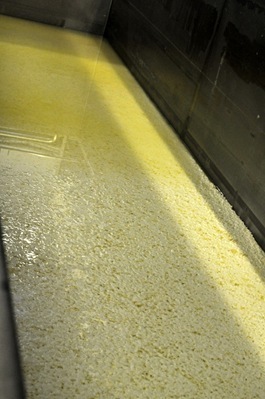 During this stage the curds are formed and separates from the whey. This process takes approximately 22 hours. Before I go any further, I must interject that the smell of cleanser is almost overwhelming inside the cheese making areas. The stainless steel sparkles and every inch, from floor to ceiling is scrubbed and buffed throughout this entire facility. After each batch of curds and whey, the vats are thoroughly sanitized before the next use. Once the curds form, the whey is drained from them and it is dried and used to make nutritional supplements. Since the curds initially form into a huge block, it is then cut into smaller blocks and broken down into smaller curds from there. It is to these small curds that the salt is added to enhance the flavor and help with maturation. We were given a small taste of the curds after salting and they have a very pleasant buttery taste much like dry cottage cheese. From this point the curds are scooped into the round molds in a process known as hooping. The molds are then stacked and the remaining whey is allowed to drain through tiny holes in the sides. The molds are then moved to the hastening room where they are held for four days and turned 3 times to keep them thoroughly drained and evenly hydrated. Each stack is rotated 3 times so it is evenly drained and hydrated. Excess whey can be seen under the stacks as they are rotated. Each stack is coded so the cheese can be traced from the time the milk cow was a calf all the way to the time the cheese reaches the shelf. After the whey is drained, the cheese is ready to be removed from the molds. At this point the drained cheese, which now weighs approximately 22 pounds, is removed from the molds, smoothed on the outside and wrapped in plastic. After 5 days the cheese is unwrapped and stored in chilled rooms to age for 5 – 6 weeks. By this time a beautiful outside crust has formed and the cheese is pierced with stainless steel needles to allow air into the cheese to accelerate the interior mold growth. The cheese is then aged for another 3 – 5 weeks before it is ready to be graded and sent to the packaging area to be cut and wrapped for sale. I was pleasantly surprised to learn that Stilton is only one of 30 varieties of cheese produced here. 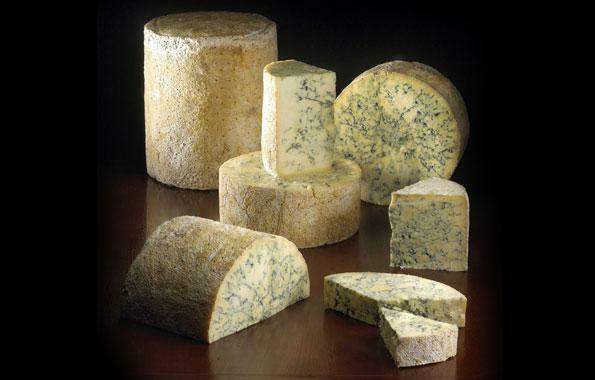 Long Clawson also makes some of the finest Blue Shropshire (which is a close cousin to Blue Stilton and is mainly differentiated by the addition of annatto for its orange color and slightly smoother finish), Aged Red Leicester (also known as Leicestershire Red), paneer, and many blended cheeses. Red Leicester cheese aging. I wish this was smell-o-vision as the rich smell of the buttery casing is indescribable. I can't thank Martin enough for all of his hard work so I could bring this fascinating process to you. For those of you living in the UK, Long Clawson's cheeses are widely available or you can order them directly from their website. If you’d like to try some of Long Clawson’s fabulous, beautifully crafted cheeses here in the US, they are available at Whole Foods, Trader Joe's, Safeway, Metropolitan Markets, HEB, Giant Eagle, Schnucks, Hagens, Savemart, Fresh and Easy, and seasonally through Williams Sonoma. Not only is Stilton a wonderful cheese to eat with fruit, nuts and biscuits, it is also a great cheese to cook with. A few years ago my host Karen introduced me to Delia Smith's delightful recipe for Stilton soup which is a combination of Stilton, celery, onions and cream and it was an instant favorite of mine. I couldn't possibly do a post about Stilton without passing this recipe on to you. For more recipes ideas, please click through to Long Clawson's site to see how versatile this cheese can be. I have to give Delia Smith full credit for the inspiration for this soup, but it is really a hybrid recipe. I combined her recipes for Stilton Soup and Bleu Cheese Soup and also felt I had to gild the lily a bit and add a few touches of my own. Since I think all soups should get the bay leaf treatment I have added one here, threw in some thyme and garlic, added a little extra stock and reduced the cream just a bit. You're really going to love this recipe. Melt butter in a large stock pot over medium high heat. Add the celery, potato and onion and cook, stirring frequently for approximately 3 minutes. Add the garlic and stir for one minute longer before adding the stock bay leaf and thyme. Bring to a boil; reduce heat to low, cover and cook until the vegetables are soft, approximately 30 minutes. Remove from the heat and discard the bay leaf. Puree with an immersion blender or cool completely and puree in batches in a blender or food processor until smooth. Add the cheese crumbles to hot soup, stirring well to combine. Add the cream and salt and pepper. Serve piping hot. This soup is delicious drizzled with a little olive oil, topped with crispy bacon crumbles, croutons or a little bit of extra Stilton.